When it comes to aquascaping styles all of them to some degree try to portray nature, however they have different interpretations on how to do it. From the raw feeling of untamed nature of the jungle style, to the more artistically defined nature aquarium and finally the simple and minimalistic feel of the iwagumi style. In the end they all try in their own way to portray nature in its most natural form. The Dutch aquarium however is different in that even though it is a piece of nature, it's not trying to replicate it. To put it bluntly this style reminds us more of a beautiful man made garden, than of a nice forest we would find walking about. The Dutch style aquarium was born in the 1930's and is recognized as the oldest style of aquascaping. As the name implies it was created by the Dutch who decided to try and replicate in their aquariums the beautiful gardens for which their country is known. Unlike the Nature aquarium, there is no aim to replicate nature, but much like it there is still a very artistical input from the hobbyist. One could say that the Dutch aquarium is a mix of the jungle style with the Nature aquarium, as it looks like a heavily planned and stylized jungle, this assumption however lacks, mostly because the Dutch style predates them and because they have their only specific set of rules. The Dutch aquariums don't use hardscape, they rely on heavy and dense planting to achieve their look. As a guideline 80% of the aquarium should be planted. Plants rely both in their height, colour and contrast to create depth and achieve a balanced composition. They are bunched in groups usually red, high contrast or larger plants are used as focal points. These tend to be selected according to the rule of thirds. Plants of similar colours shouldn't be placed next to each other, this is also applicable to similar leaf style plants. Also any given plant should only be used once, so having two bushes of the same plant in different areas of the tank shoul not be done in this style of tank. Techniques like terracing are used. This is the raising of substrate and use of plants at different heights. Different colour plants are arranged specifically to create contrast and highlight focal points. Another technique used is the creation of the so called streets, these are generally pathways where plants are shaped at an angle going from front to back increasing their height gradually. This creates and amazing sense of depth. These tanks tend to be very challenging as the hobbyist only relies on plant growth, to grow a dutch style aquarium one really needs to know how to grow plants. Because they are so densely planted they generally are hight-tech planted aquariums. 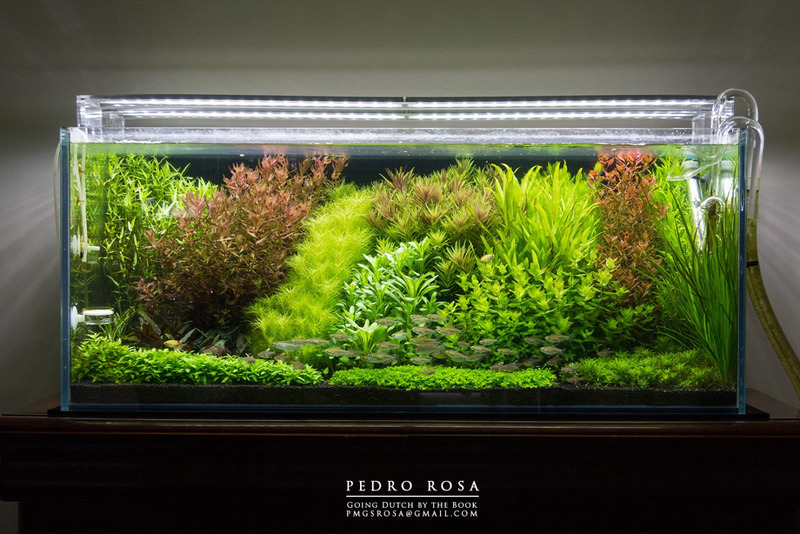 As in they rely on high-light, heavy co2 dosing and fertilization, this leads to fast growth rates which require a good amount of trimming and maintenance to look good. One should consider this when planning to go for this style. The plants used in the tank are mostly stem plants, as they generally grow fast and can be trimmed and shaped to give that dense look. There is a competition going on for this style, it has been going on for many years dating back into the 1930's. This was organized by the various dutch aquarium groups but unlike the modern aquascaping contests, the judges would go personally see the tanks to judge them instead of just judging the photo. They would be judged on things like plant health, composition, fish health just to name a few. These tanks more than any other style are truly underwater gardens, they are not easy to keep, but the amount of skill to achieve a true dutch style aquascape makes them very rewarding and a good challenge for those willing to test themselves. Me myself, I have not ventured into this style, but it is something that I hope to do soon.